There’s an old saying about being a voice, not an echo, as a way of telling people to be original. My wife and I have always tried to be that way, especially in my writing and her art. Yet, there we do follow the pack in one area. We now have an Alexa from Amazon. We’d been reluctant to do so. There were a couple reasons. First, there was the issue of privacy. We’ve heard stories about those things monitoring what people say and sending the conversation in emails. That’s not good and quite the invasion of privacy. Second, we wondered just what in the world we would actually do with one. Third, and this was the big reason, our daughter is Alexa. Let’s face it; we say the name often. We really didn’t want the mechanical Alexa responding every time we talked about the biological one. Then, an answer came to us while we were visiting my mother-in-law, Penny, who had recently bought an Alexa. Penny she lives alone. She liked the idea of having an Alexa, just in case of an emergency. Alexa can also pick and play music for Penny. Yet, Penny thought Alexa from Amazon needed a name change. Jo Ann, my wife, and I agreed. Great, but we had no idea how to change the name from Alexa. It was so simple, though. We asked Alexa, “How can I change your name?” As it turned out, she has many names we could use. Hence, Alexa from Amazon became Echo. After that, we went through a series of orders and questions, asking Echo to tell us things about history, the solar system, movies and pop culture. Echo is knowledgeable. Echo, “What is the meaning of life.” After a momentary pause, Echo gave the correct answer. The correct answer, of course, is forty-two. That did it and convinced Jo Ann to get an Alexa from Amazon. Well, just the other day, she did. It took a bit of doing to navigate the setup procedure to link it to our house Wi-Fi, but we managed and immediately changed its name to Echo. We then took the Echo, which has a woman’s voice, for a spin, so to speak. Jo Ann asked for music, it played a top ten hit. I asked for news, it switched over to a recording of the latest headlines. Then I got an idea. I’d heard that the creators of the Alexa system had a sense of humor and they were, quite naturally, computer geeks. Turning to the device, I said, “Echo, open the pod bay doors please.” Echo informed me she couldn’t do that, she even called me Dave. Echo then explained she wasn’t HAL, from 2001: a space odyssey, and I wasn’t an astronaut in outer space. Jo Ann didn’t get it, so I explained and we had a good laugh about it. 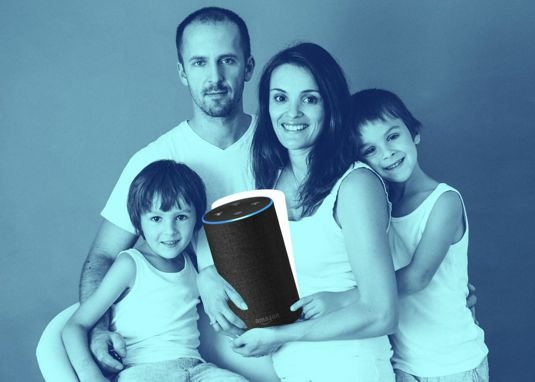 She is so looking forward to using Echo to play music whenever she wants and to be able to tailor the playlist to her liking; she does love her classic rock and Neil Diamond. Guess I’ll have to slip in the occasional Britney, Christina and Lady Gaga tune. Just last night, I used Echo to help put our foster son, Zane, to bed. I asked Echo to set a ten-minute timer. When the alarm went off, it was bedtime, no argument. It worked well and Zane was even to switch off the alarm. Welcome to the family Echo. It would seem our family has taken another step into the Twenty-First Century. Where this new technology takes us, I’m not sure, but then I questioned the need for a home computer and internet service. Now we can’t live without either of them. Welcome to the family, Echo, I hope you turn out to be a good friend.